Renault’s current tenure as a Factory F1 team turns four this year, during which time the operation at the team’s UK headquarters has been upscaled, to bring the team back to its glory days. This rebirth paid dividends last year when the Renault team achieved an impressive 4th in the constructors’ championship and ‘best of the rest’ status. For 2019, the stakes get higher, with an expectation to consolidate its position and close the gap to the top three. Responsibility for this lay on the shoulders of the RS19, the team’s new car for 2019 and on first inspection it appears to be another step forward for the team. The road back to success for Renault takes time, by recruiting the staff to develop and optimise the car’s design. 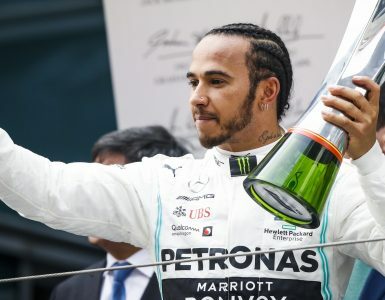 This has been evident over the past three seasons, when the design team stepped up their work – and with last season’s RS18 they were close to a fully contemporary F1 car design. Some aspects of the car’s design take longer to mature, the team only gaining a carbon fibre gearbox last season and numerous other systems owing their design to earlier cars. 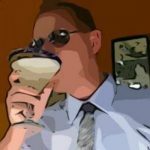 For 2019, the team says that only the steering rack is a carryover item, everything else is new. It’s already visible that the growth at Enstone and the opportunity with the new regulations gives Renault a fresh start this season. As a result, the RS19 is a near total departure in design terms from its forebears. To Renault’s credit, the renders released with the team’s new season launch are quite detailed in contrast to other teams’ digital cars. At the launch event in Oxfordshire, the car unveiled was a RS18 with some 2019 parts fitted to give it the ‘look’ of a new car. 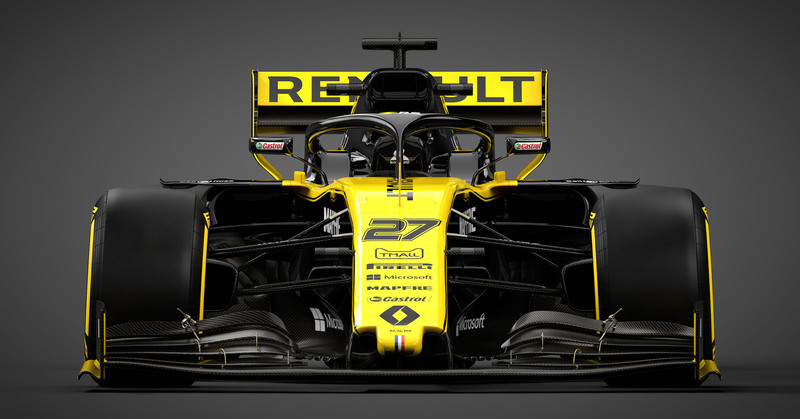 So, it’s the renders that we’ll base this analysis off, as Renault have taken this approach most years, with a cut & shut launch car, but far more accurate renders. 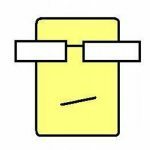 As with every car seen so far, the front wing is a simplistic version of what the rules demand, what could be a Version 1.0 design, that will soon morph into something more aggressive. While much of the shape of the wing profiles and endplates can be ignored, the addition of detailed flap adjusters and slot gap separators show the thinking that many teams will apply to these parts. Renault only appears to have the last inner element of the flaps adjustable, but it’s the angled design of the flap adjuster and sealing plate that show that these parts will be used for flow management, with the absence of the complex add-ons banned over the winter. Meanwhile, the nose is similar to last year’s, with a thumb-tip design and no S-Duct, albeit with slots made into the front wing mounts (already a practice for some teams in 2018) but even more useful this year with the simplified aero regulations. From these images, the nose shape appears to be very thin and protruding from its mounting with the chassis. 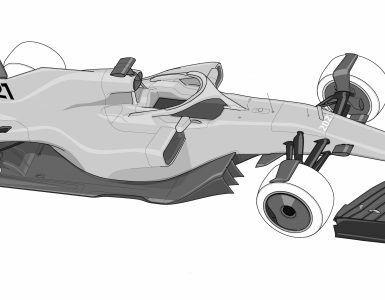 But this is trick of the eye, as the front turning vanes fitted under the chassis are missing, giving the impression of more open space than there should be under the nose. Suspension-wise, the Renault follows its established practice with low mounted wishbones to give better geometry, perhaps at the expense of their aerodynamic obstruction. The simpler-for-2019 brake ducts are quite large, and this may perhaps point to the practice of blowing air through the wheel to create aerodynamic outwash with the lack of trickery allowed from the front wing and blown axle. The front wheel shows an inner rim fitted, that would align with the brake disc mounted inside the wheel, air can be blown around the discs and into the gap created between the wheel and inner rim, for a useful and legal aero effect. One curiosity of the front hub design is that there are holes made into the axle outboard of the wheelnut. There was a similar practice initially used by Red Bull, that blew air through such holes, but this was banned as it contravened the brake duct bodywork rules. These features require closer examination to understand if they are just for lightweight gain or aerodynamic effect. The monocoque follows some recent Renault practice, with its trademark wide inlet, split by the Roll structure itself and the three inlets formed within feed the engine’s airbox and cooling radiators mounted around the engine. Renault appears to have kept narrow mounted wing mirrors and not spaced them outboard, adopting elongated mounts for the aero purposes – although this can easily be changed during testing. Around the mirror stalks are two fins either side of the cockpit. These fit into the blind spot in the bodywork rules and are used to direct airflow around the cockpit opening and over the rear bodywork. One key concept discarded from the RS18 is the sidepod layout, Renault following the fashion for High-top sidepods, which have been adopted by all 2019 cars launched to date. 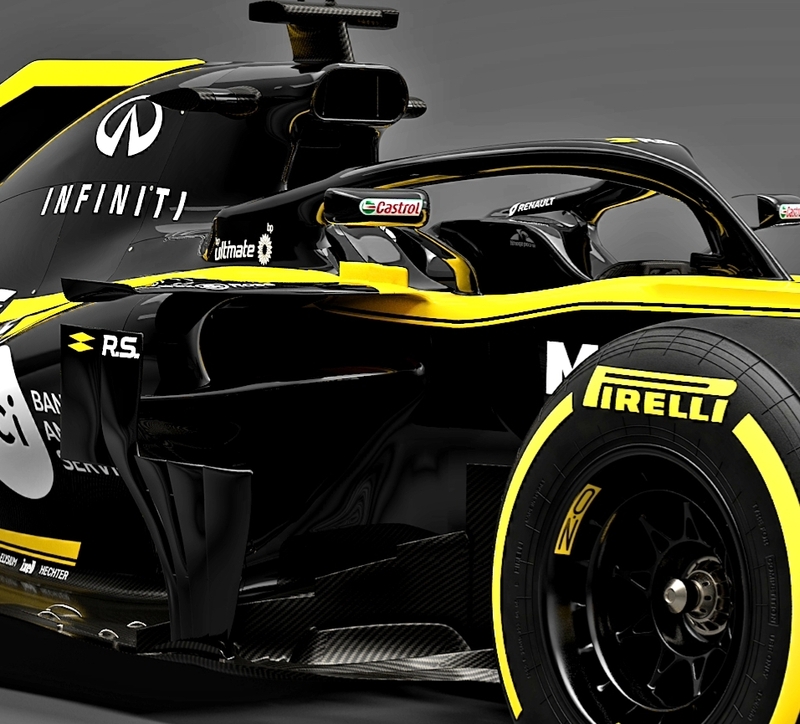 Renault’s interpretation follows Red Bull’s 2019 design quite closely. The single high inlet is forward facing with the lower edge formed off the side impact protection spar that reached out to support the sidepod vanes, while above the inlet there is an elegant fin that flicks up at its tip, to create downwash over the sidepods towards the diffuser. Downstream, the sidepods retain the deep undercut created by the high inlet all the way to under the gearbox to force high pressure air over the diffuser for more downforce. Helping direct this airflow are the bargeboards and sidepod vanes, which are already shown as being quite complex on the launch images. The reduction in height allowed for this bodywork is reflected in the stepped shape of the sidepod vanes, termed ‘Aerocats’ by Renault, as they previously appeared cat-like from the swooped shape ending in four feet at their base. Losing the height for bodywork around the bargeboards succeeds in shaping bodywork to create downwash to push air towards the sidepod undercut. Renault has curled over the top of the bargeboards to form a horizontal surface to achieve this. Despite decades of continuous service in F1 providing power units, the switch to the turbo hybrid era hasn’t shown Renault’s Viry operation in its best light. The initial power unit in 2014 was underpowered, unreliable and appears to have demanded a bigger cooling package than its rivals. 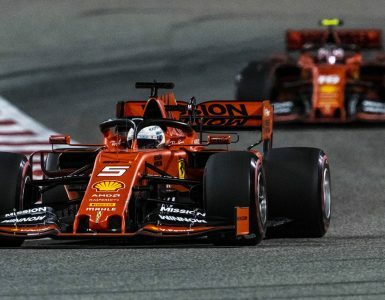 In the years since, the PU has improved but not to the extent that it’s a challenge for Mercedes or Ferrari in terms of power delivery or reliability. This led to a fractious relationship with Red Bull, who have now switched to Honda power Units, leaving Renault supplying just its factory team and McLaren. Like Ferrari, Renault run a closely coupled turbo, with the compressor and exhaust driven turbine mounted next to each other at the back of the engine. This has some packaging pros and cons compared to the Mercedes or Honda split turbo, but certainly isn’t a root cause of any performance deficit. As with Honda, there is talk of major gains with the new PU over the winter and the option for a more powerful qualifying mode, something lacking from the features of the Renault PU. 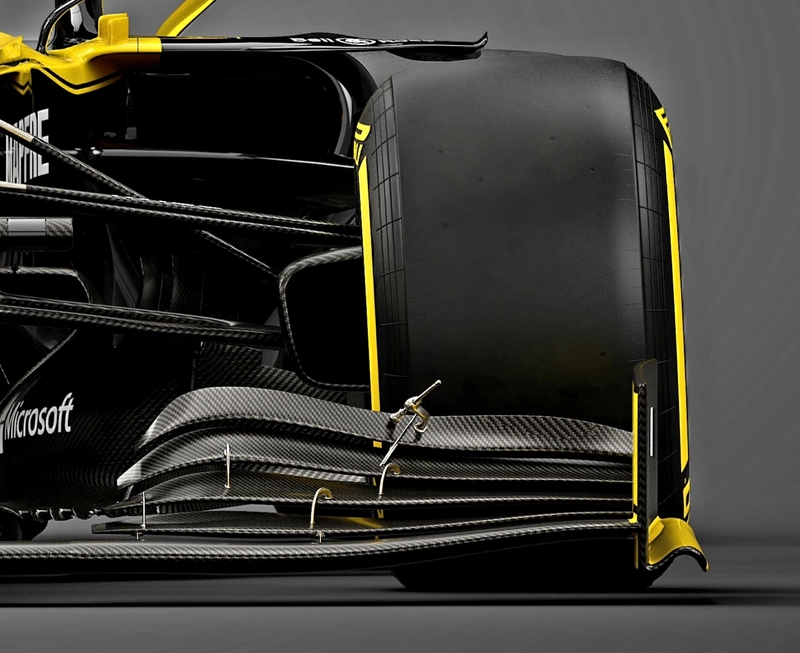 Another key Renault feature apparently missing from the RS19 is the blown rear wing. This was a solution raced, somewhat controversially, last year. The exhausts were tipped up to the maximum height and angle to blow the exhaust plume under the rear wing for a little extra low speed downforce. The new car with the higher mounted rear wing drops this philosophy and mounts the exhausts lower down in a more conventional style. The twin rear wing mounting pylons support a simple monkey seat. In contrast to the detail seen on the front wing, the floor’s edge and rear wing appear to be quite simple solutions in these images. As both will have performance-enhancing slots added where legal, we can expect these areas to become much more complicated than we see here. Renault still has a lot to do with its operations at Enstone and Viry, as well as bringing its car design up to scratch. Like several of the car launches we have seen, several key features like the sidepod design have become commonplace, and with Renault also adopting these it will need to go further with its design to make a real step forward. As we can’t see these in the launch images, we will hold judgment until the fuller aero package of the RS19 appears through the coming weeks of testing.